Orchesis members Helen Roets (‘21), Katherine McKeown (‘22), and Elizabeth Hand (‘21) line up before performing “Cell Block Tango” from “Chicago” in SPIN Theater’s Musical Cabaret. 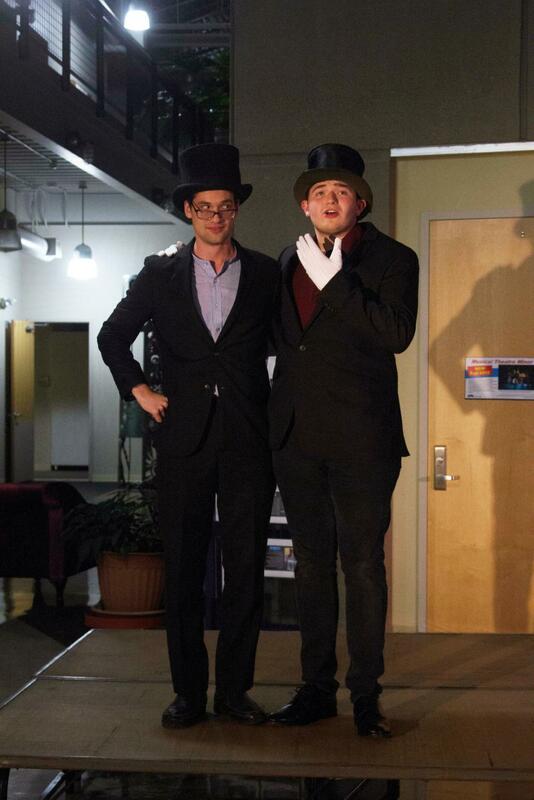 SPIN Theater’s annual musical theater cabaret, held in collaboration with Orchesis, took place on Sat., Oct. 20 in the atrium of the Center for the Arts. The performers stood on a small stage, singing and dancing to a selection of pieces chosen from a variety of musicals and other theatrical work. The show’s risqué atmosphere was epitomized by the show stopping “Cell Block Tango” from “Chicago.” This was a collaborative act, featuring six performers from SPIN, alongside dancers from Orchesis. The song featured the “Six Merry Murderers of the Winneshiek County Jail,” and throughout the number, each woman candidly described the murder that landed her in prison. 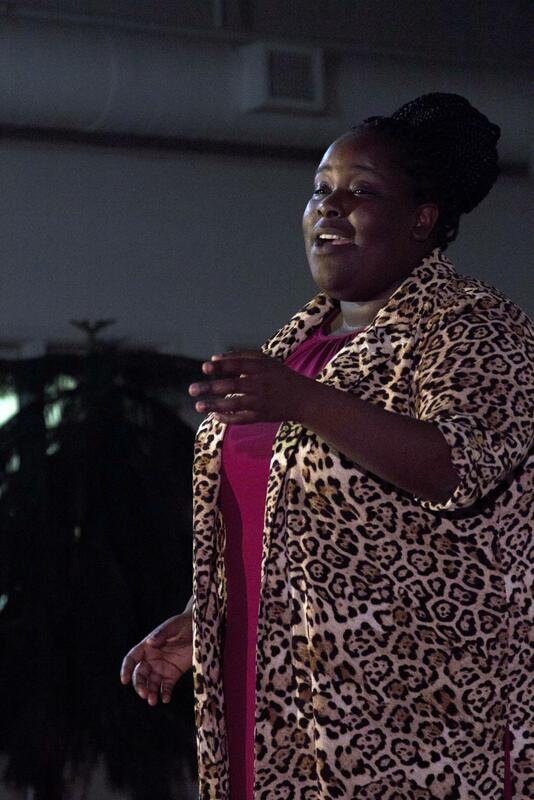 Janet Irankunda (‘19) performs “I Know Where I’ve Been” from “Hairspray” in the SPIN Theater Cabaret. Throughout the monologues, Orchesis dancers took the floor, reenacting each scene as described by the “murderess.” Each performer wore only black and red, as well as a pair of fishnet tights. Their performance closed act one of the cabaret. During the second act was a performance of “Don’t Tell Mama” from “Cabaret.” Vivian Kampschroer (‘22) acted the role of Sally Bowles and walked on stage in a large sparkling robe. In this role, Kampschroer revealed to the audience that her mother did not know her occupation of a dancer at a nightclub. As she unbuttoned her robe, her costume was revealed: lacy shorts, fishnet tights, and a black corset. Her piece was performed in a burlesque-style, with an air of sarcastic comedy, which drew laughs from the audience. This number aired on the sexual side of the “After Dark” theme. SPIN Theater Managing Director and cabaret co-director Anna Becker (‘19) thought that the show was appropriate for the season. An integral feature of the cabaret was the element of dance, brought by Orchesis. The collaboration between SPIN and Orchesis for this event is a new addition to the cabaret. Tiegs was impressed with Orchesis after watching them perform last year and that experience made him want to collaborate on a project with the dance group. Orchesis performed in multiple numbers at the cabaret, including “Sugar Daddy” from “Hedwig and the Angry Inch,” “The Cell Block Tango” from “Chicago,” and a combined performance piece that featured two songs and a duet of dancers. Bethany Larson (‘19) and Haley Steffen (‘19) choreographed this emotional piece. It discussed mental health issues through the songs “Lifeboat” from “Heathers” and “Lost in the Waves” from a contemporary song cycle called “Out of Our Heads.” The groups met with Luther Counseling Services to get input on how to authentically and sensitively communicate these ideas. Tiegs discussed the significance of this piece. The cabaret is the first SPIN Theater event of the year, with many more to come. Tiegs shared some of the other upcoming SPIN events. As SPIN looks forward to the upcoming months, Tiegs recognized SPIN’s desire to be inclusive to all members of the Luther community regardless of experience.